Michael Ondaatje’s “Divisadero” tells the tale of Anna, her adopted sister Claire, and their father’s farmhand Coop, growing up in the poetic splendor of their California homestead. After scandal and tragedy separate the three, Anna eventually ends up in France years later researching the life story of a French novelist and poet, Lucien Segura, who found fame, fortune, and heartbreak in the years surrounding WWI. Ondaatje (best known for penning “The English Patient”) has a fluid and emotional writing style that is as wondrous and evocative as it is frustrating. The casual reader might find themselves lost or distracted by dialog without quotation marks, arbitrary flashbacks, shifting POV’s, and stories within stories that fold in on themselves and only relate to other characters through mere coincidence. Ondaatje creates a vivid sense of place with both Californian wine country and rural France, but often times a reader might forget where they are and be left wondering what happened to a certain character who had been a focus for so long. “Divisadero” sometimes reads like a collection of short stories where a few of the characters or settings overlap. There’s no central plot, and the prose meanders to no solid conclusion. Ondaatje populates the novel with thematic repetition (fathers uncovering secrets of their grown daughters, men wishing they were carefree boys again, love triangles) and character foils that make it an endlessly interesting read for those with the patience for his literary style. The book, though at times maddening, is full of small moments, captured with great clarity of vision, that add up to something ponderous that is beyond the scope of any words. 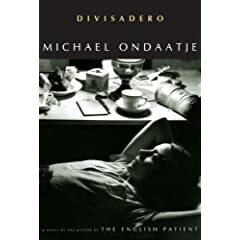 This entry was posted in Book Reviews, Books, Literature and tagged Divisadero, Literary Fiction, Michael Ondaatje, Novels.